Wilna Ferré Obituary - MELFORT, Saskatchewan | Fedusiak Funeral Chapel & Crematorium Ltd.
Wilna Ferré loved life. She appreciated good music, good wine, good food and the beauty of nature. Wilna loved her family and friends with her whole heart. Wilna Ferré was born on May 5, 1954 in Saskatoon, SK to Anthony and Janny Looy. Along with her sister Janice and her brother Anthony, the family lived between Saskatoon and Kingston, Ontario. 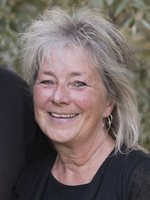 Wilna grew up speaking Dutch and made several trips to the Netherlands to visit family. She studied education at the University of Saskatchewan where she met Alain, the love of her life. They were married August 30, 1975 and spent 43 years together building a beautiful acreage out of prairie dirt. Honouring her Dutch past and fully embracing his French heritage they welcomed three children: Daniel, Christophe and Sara. Wilna was ecstatic to welcome eight grandchildren over nine years; she made a point of attending their many activities whenever she could. Wilna was passionate about teaching. She enthusiastically shared her love of history, books and learning with her students. Wilna was a favourite teacher and had a positive impact on many lives. Many colleagues became lifelong friends. Wilna loved to celebrate – holidays, birthdays and accomplishments were a reason for her to prepare, decorate and cook for memorable gatherings. No one was more excited than her on Christmas morning! Culture, language and tradition were very important to Wilna. She loved her yard and spent hours planting flowers, trees and her garden. When she wasn’t planting, she was planning. Wilna loved to have people come together. She was truly grateful for the support of her friends, family and community in the whirlwind of the past two months. Wilna leaves behind her beloved husband Alain, three children: Daniel (Jodene) – Jaxson, Rayne, Rhéal and Reese; Christophe (Arien) – Léa and Olivier; Sara (Greg) Pohler – Brielle and Rémi; brother Anthony (Heather) Looy, sister Janice (Wim) Lock; Alain’s siblings Denis (Danièle), Bernard (Fernande), Anne (Paul Dubé), Lorraine (Jerry Hoehn), and many cousins, nieces and nephews. Wilna was predeceased by her parents Anthony and Janny (née Van Beek) Looy and Alain’s parents Théophane and Olive (née Perault) Ferré. To send flowers to the family of Wilna Mary Ferré (Looy), please visit our Heartfelt Sympathies Store.